Tom Craig was born on June 16, 1909 in Upland, California to Dr. William Howard Craig and Lois Cheney. His father was a prominent doctor in Upland, and two of his siblings went on to become doctors. Coming from a scientific family, Craig took up botany at Pomona College in 1925. He took a leave of absence for two years in 1928 after contracting tuberculosis. For the sake of his health, Craig moved to Palm Springs hoping the warmer climate would help him improve. During his stay in the desert, Craig pursued painting as a form of therapy. After encouragement from a desert artist, Craig took an interest in painting seriously. When he returned to Los Angeles two years later, he began studying under Frank Tolles Chamberlain (1873-1961) and Clarence Hinkle (1880-1960). Craig enrolled for a second time in Pomona College in 1930, studying both botany and fine art. It was at Pomona College where Craig met fellow artist Milford Zornes (1908-2008), with whom he developed a lasting friendship throughout his college years. In 1930, Craig and Zornes insisted on studying under Millard Sheets (1907-1989) at Pomona College, although he was located at a different college. It was Millard Sheets and Thomas Beggs (1899-1990), the head of Pomona College’s Art Department, who first encouraged Craig to be serious about his art. (American Scene Painting 85). Together, Tom Craig and Milford Zornes traveled around the California coast, painting and working together. Craig’s first exhibition at the Mad Hatter Restaurant in Laguna Beach, California was a dual exhibition with Zornes. They continued their friendship throughout college until Zornes married and Craig began teaching at Occidental College in Glendale, California. Craig graduated from Pomona college in 1934 with a degree in Botany. Craig’s fame began to rise as he was included in various exhibitions throughout California. His awards fueled his reputation as an upcoming artist in both oil and watercolor paintings. In the summer of 1937, Craig was a part of an organized exhibition that traveled throughout California; the exhibition was titled “The California Group.” Craig represented Southern California along with nine other artists. Alfred Frankenstein from the San Francisco Chronicle commented on Craig’s work, writing that he was, “one of America’s finest water colorists” and called him “the master of Mist and Water” (American Scene Painting 60). The group exhibition was well received and furthered Craig’s reputation in the California Style. In addition, the phrase “master-of-mist-and-water” would stick with Craig throughout his career. This came from his technique of wet-on-wet, a style that he worked on continuously in Northern California. Family was a major motivation for Craig continuing his art. In 1938 he married Frances Stack, and would have five children with her in the duration of their marriage. The financial need to support his family led Craig to teaching at both Chouinard and the University of Southern California. Additionally he grew irises for money, a hobby that continued throughout his life, and applied for a Guggenheim Fellowship. He was awarded the fellowship, and traveled throughout the Southwest painting mine towns. His travels took him through Nevada, Texas and parts of Mexico. When the War broke out, Craig applied to the War Department for a job as an artist war correspondent (American Scene Painting 86). He was hired in 1942 by Life magazine, and was sent to Asia briefly. After his time in Asia, he was re-stationed in Italy to the frontlines, where he sketched and painted G.I.s in action. After the war, Craig decided to focus mainly on his botany and retired from painting. He moved with his family to Escondido, California, to a 250 acre farm purchased before the war. He turned to his love of botany, and cultivated irises for the remainder of his life. He painted occasionally, but turned the majority of his attention to raising hybrid flowers and experimenting in botany. His influence on painters through his years at Pomona, Occidental, the University of Southern California and Chouinard was undeniable. He had been a major influence on the California Style, with his wet-on-wet technique. Tom Craig died in 1969 in his native town of Upland, California. Tom Craig is remembered as one of the first artists working in the California Style. 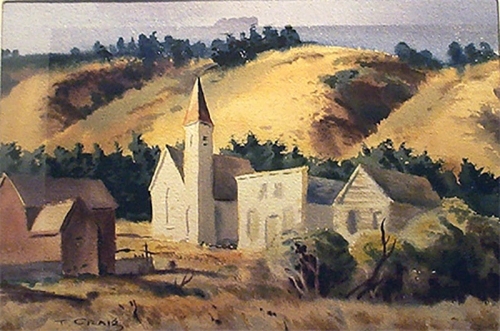 The California Style emerged during the 1930s and 1940s; “It was characterized by large format size, free, bold brush work, and strong, dark, rich colors” (American Scene Painting 44).Craig began painting while recovering from tuberculosis, but did not take his art seriously until after taking classes with Millard Sheets. Sheets was another pioneer in the California Style, and influenced Craig’s art immensely. Craig worked primarily in watercolor, but painted in oils as well, winning several awards in both mediums. Craig’s subjects were typically the landscape of Northern California. California artists during this time were known for painting outdoors or relying on their sketches of nature to complete a painting, using the medium of watercolor. Craig joined the California Water Color Society, which helped promote his art in various exhibitions; the artists in the California Water Color Society are credited with creating the California Style. Craig was also associated with a group of Southern California artists who painted Regionalist subjects. These were subjects that showed their native lands; they created both positive and negative urban and rural views, and often incorporated social or political commentary (American Scene Painting 19). Southern California was going through immense change because of the Great Depression and the New Deal, which was reflected in Craig’s work. “Southern California, with its Hispanic legacy, large population of Pacific Asians, and influx of European émigrés, was conditioned by its multicultural nature. Murals and paintings of the California scene such as Tom Craig’s Plaza Los Angeles, 1935, reflected that reality” (American Scene Painting 19). Craig’s early paintings of California documented the changes he saw throughout California, associating him with the American Scene movement. “Tom Craig’s favorite medium was watercolor, and his style is notable for its use of the wet-on-wet technique to depict foggy and rainy days” (Scenes of California Life, 1930-1950 25). Craig’s watercolors were best known for his use of his water-and-mist style. His art was given a positive review by the San Francisco Chronicle, dubbing him the “master of mist-and-water.” His portrayals of foggy and rainy days were inspired from Northern California and he would often travel north for his paintings after recovering from tuberculosis. The Los Angeles County Museum of Art website notes that, “Characteristic of the California watercolor style were vigorous brushwork, a bold palette, a large format, and references to oriental painting.” Craig used wide, vigorous brushstrokes throughout the majority of his paintings, and typically painted landscapes. Additionally, it was noted that Craig would travel far distances from his Southern California home for the perfect painting without being bothered by the miles travelled. This attitude would be useful when he was awarded the Guggenheim fellowship and travelled throughout the Southwest. Craig applied for the Guggenheim fellowship and was awarded it, allowing him to travel throughout the Southwest and paint. He focused on mining towns; however he focused his paintings on the mundane instead of the mining industry. For example, in Mining Town I, from 1941, Craig focused the painting on the dirt road, and mist can be seen covering the mountains. His deserted town comments on the booming industry of mining and the effects it had once the mine “went dry” (“Thomas Craig”). Later in his career, Craig traveled to the South to paint African-Americans and the reality they lived in. He did this series of paintings in oil, breaking away from his watercolor landscapes. He was credited with painting them realistically yet maintaining their dignity in his art. He also travelled to Asia and Italy during World War II as an artist correspondent for Life magazine. He painted or sketched the soldiers in action from the front lines. After his time spent overseas Craig decided to retire from painting, leaving behind an impressive collection of both watercolors and oil paintings. 1. American Scene Painting: California, 1930s and 1940s. Ed. Ruth Lilly Westphal and Janet Blake Dominik. Westphal Publishing, 1991. 2. Hughes, Edan Milton. Artists in California, 1786-1940. San Francisco: Hughes Pub. Co., 1989. 3. Moure, Nancy Dustin Wall. The California Water Color Society: prize winners 1931-1954. Los Angeles: 1975. 4. Regionalism: The California View; Watercolors 1929-1945. Santa Barbara: Santa Barbara Museum of Art, 1988. 5. Scenes of California Life, 1930-1950: Todd Madigan Gallery, California State University, Bakersfield, March 9-April 10, 1991. Bakersfield: Dorian Society, California State University, 1991. 6. Stern, Jean. Selections from the Irvine Museum. Irvine: Irvine Museum, 1992. 7. "Thomas Craig." Artwork in Focus. Los Angeles County Museum of Art. 12 Dec. 2008. .
8. "Tom Theodore Craig." AskArt. 8 Nov. 2008 . 9. Who was who in American Art 1564-1975: 400 years of artists in America. Ed. Peter Hastings Falk. Madison: Sound View Press, 1999.